On Thursday 9 April, the official naming ceremony took place for IRM (Inspection Repair and Maintenance) light construction vessel the Olympic Bibby, at the Kleven Shipyard, Norway. The ceremony saw the vessel’s official Godmother Mrs Connie Brown, wife of recently appointed Chairman of Bibby Offshore Mike Brown, christening the NORSOK compliant, 4,500 tonne vessel in front of a crowd of 250. 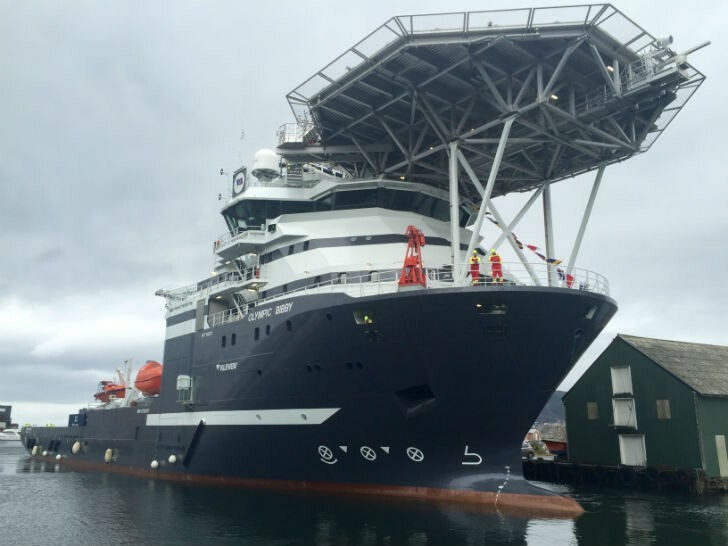 Bibby Offshore, leading provider of subsea installation services to the offshore oil and gas industry, signed a charter agreement with Olympic Shipping in March 2014 for the newly built Olympic Bibby. The agreement for the subsea support vessel is for a three year period, with options to extend for an additional two years. Arne Lier, Managing Director of Bibby Offshore AS, said: “We aim to further grow our capacity and presence in Norway by providing a superior service for our clients.